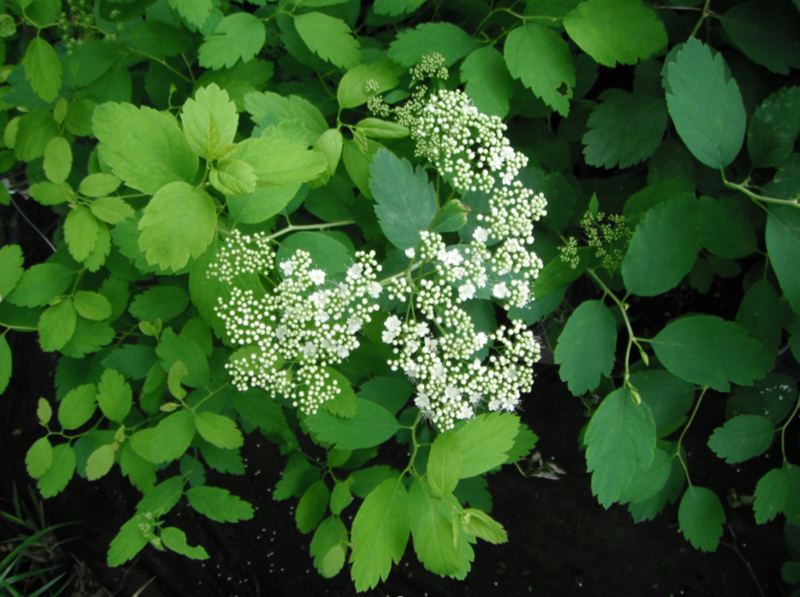 Names: The word Spiraea comes from a Greek plant that was commonly used for garlands. Spiraeas are collectively known as Meadowsweets. 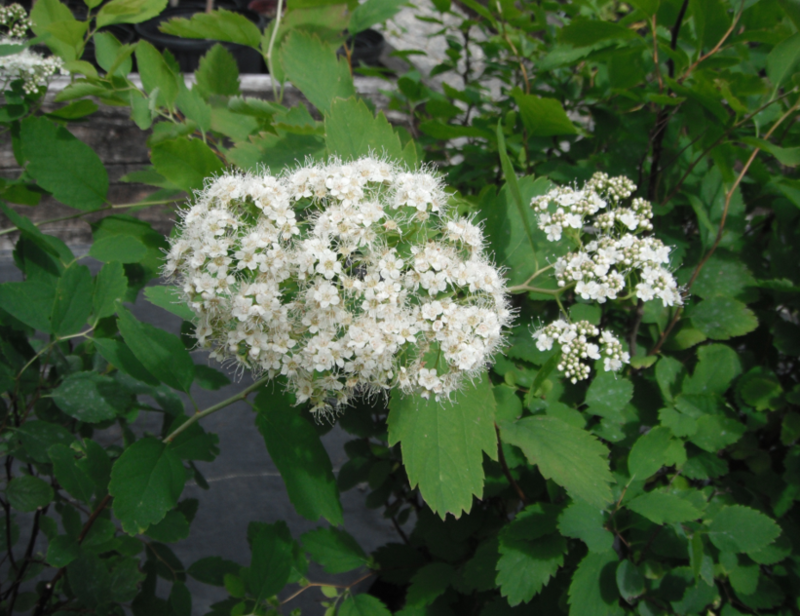 Shinyleaf Spiraea was formerly considered a variety of Birchleaf Spiraea, Spiraea betulifolia, It is sometimes called White Spiraea or White Meadowsweet. Lucida means shining. 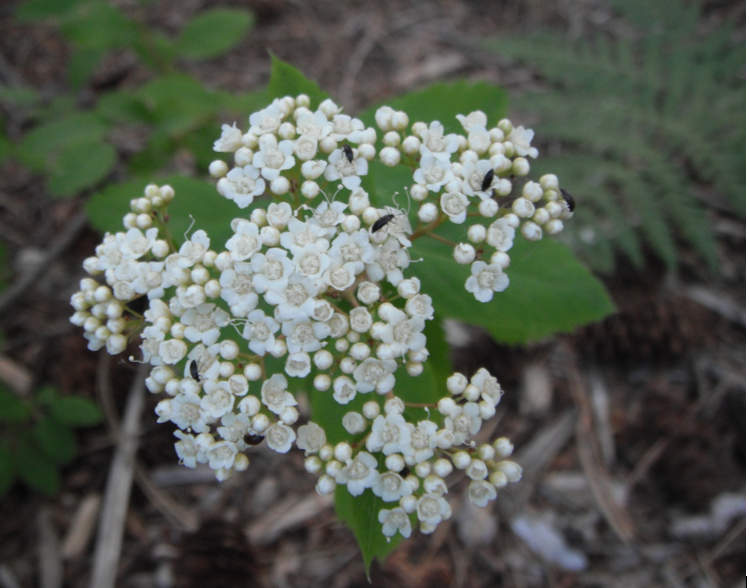 Relationships: There are about 80-100 species of spiraea in the temperate regions of the northern hemisphere-the majority in eastern Asia. Many are grown for ornamental landscaping and there are several cultivated varieties, mostly of the Japanese species. Distribution: It is found from British Columbia to Oregon from the foothills of the Cascades, through the Rocky Mountains, eastward to Saskatchewan and Minnesota. 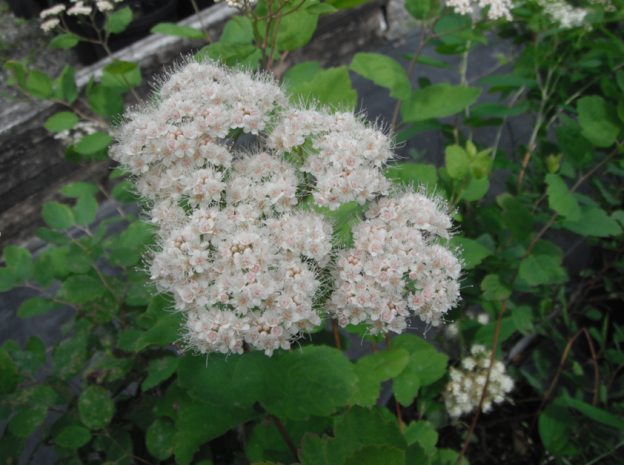 Growth: Shinyleaf Spiraea grows only to about 1-3 ft. (30-90 cm). It spreads by rhizomes and often grows in large colonies. Habitat: It grows in open forests and on dry, rocky slopes; from foothills to wetter forests at higher mountain elevations. Wetland designation: Tentative FAC*, It is equally likely to occur in wetlands or non-wetlands. Diagnostic Characters: Its leaves are egg-shaped, doubly-toothed past the middle; bright green above, paler below. White flowers are borne in flat-topped clusters. In the Landscape: Like many spiraeas, this shrub is charming in a landscape and is especially useful when a smaller shrub is desired. 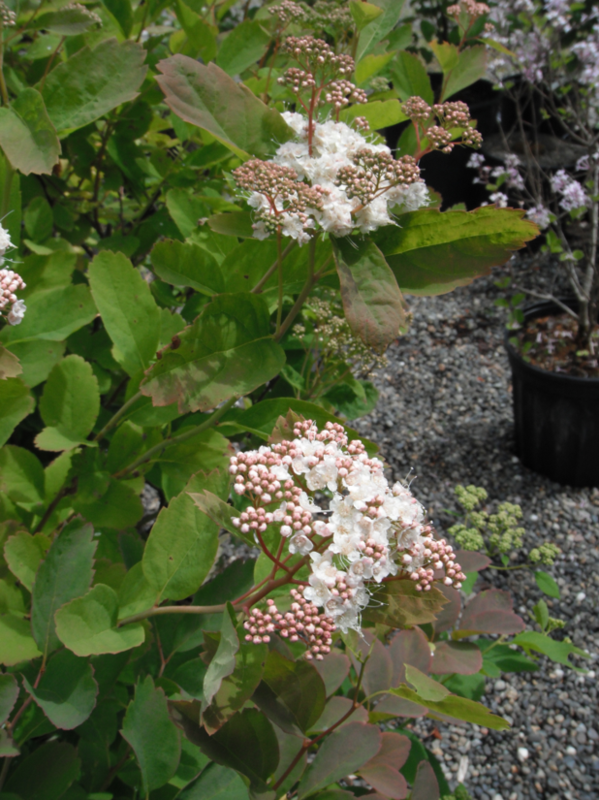 It has great potential for mixing with Subalpine Spiraea in borders or foundation plantings. temperature differences between elevational sites. Propagation: A 60 day cold, moist stratification. of seeds is recommended but germination may occur without a stratification treatment. 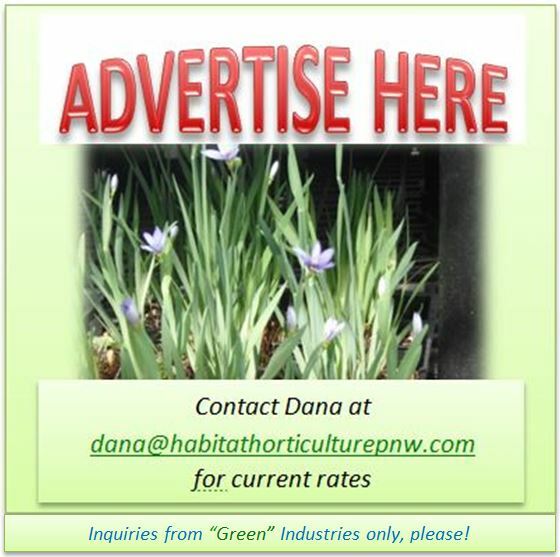 Cuttings also may be taken in early to mid June. Use by People: A tea, made from branches, leaves or roots, was mostly used to treat abdominal and menstrual pains by natives. 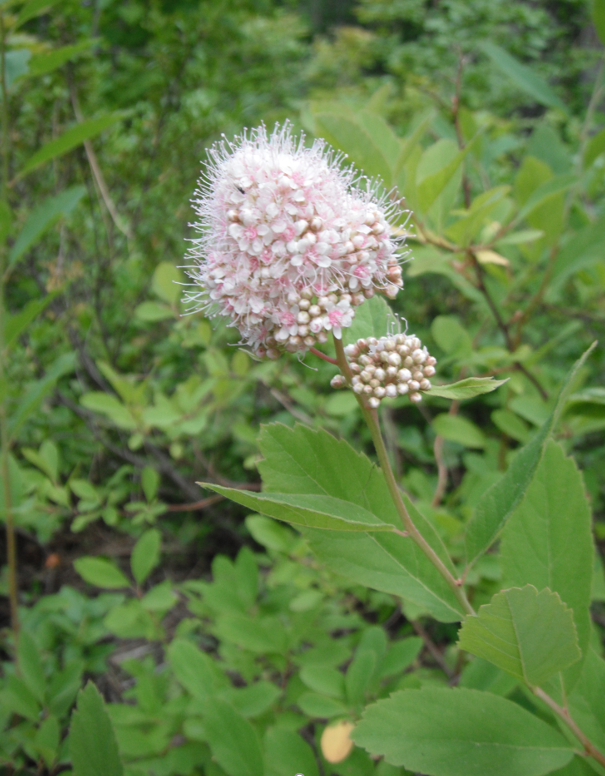 Use by Wildlife: Shiny spiraea is considered a poor forage species and also does not provide good cover. But is possibly a good species for pollinators such as butterflies. 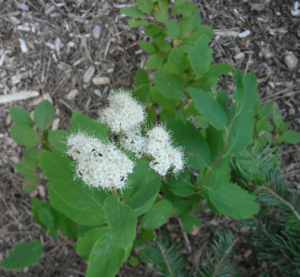 Pyramidal Spiraea, Spiraea x pyramidata, is a naturally occurring hybrid of S. betulifolia (lucida) and S. douglasii. It is intermediate to both of its parents, growing 4-5 feet (130-160cm) with flowers in pyramidal clusters, white to pale pink. This entry was posted in Deciduous Shrubs & Vines on May 23, 2016 by habitatdana.